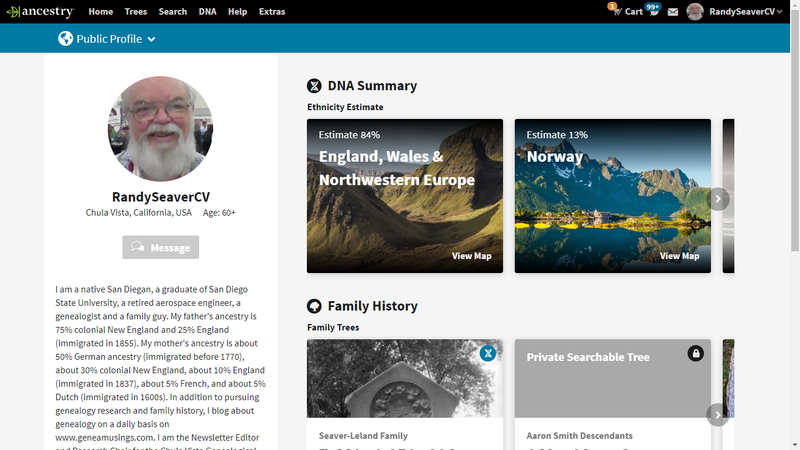 Ancestry has unveiled one improved feature for their website -- User Profile, and has revealed a second improved feature - Messages. 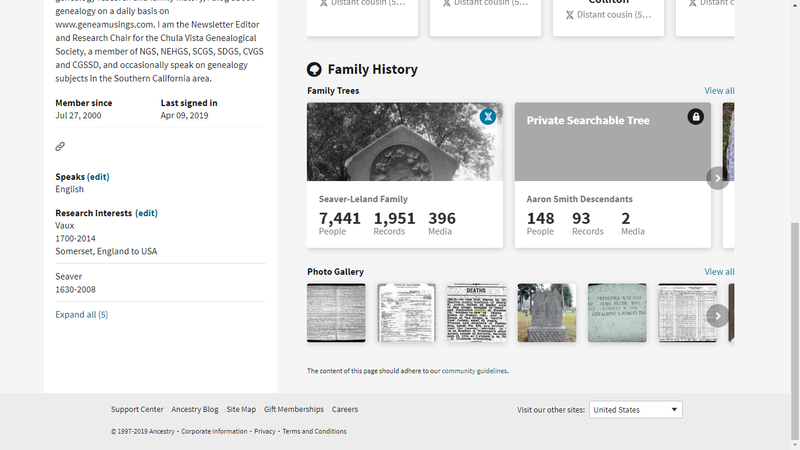 If an Ancestry user (guest or subscriber) clicks on their username in the upper right-hand corner of the screen, they will see their Profile information. Further down the screen are sections for Research Interests, Recently Added Content, Ancestry Public Member Trees, Favorite Message Boards, Activity, About, Family History Experience, and Websites. Note the gray "Beta Off" switch at the top right of the screen below the user name. 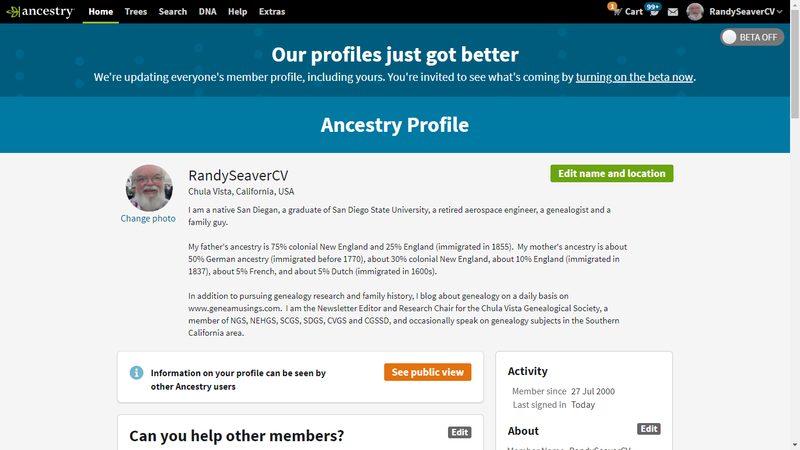 The profile information has been moved around - the introduction, some of the member activity information, and the research interests have been moved to the left-hand side of the screen. There is a green "Edit" button for this information, and a "Settings" button also. 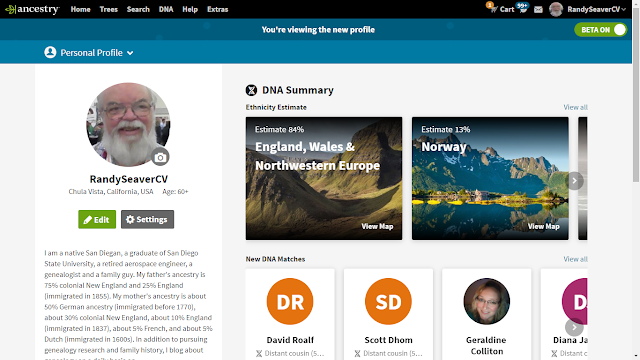 On the right-hand side of the screen, there is information about your ethnicity estimate, your newest DNA matches, up to 10 of your searchable family trees, and a photo gallery of uploaded images. The above is my "Personal" profile - what I can see about myself. 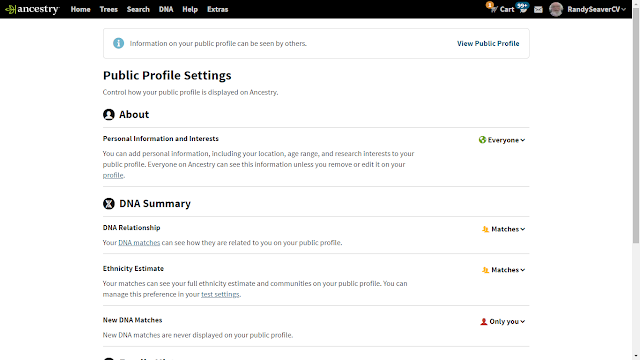 The user can see their "Public" profile - what other users will see if they click on your user name - by clicking on the "Personal Profile" button in the upper left corner of the screen, and select "Public Profile." 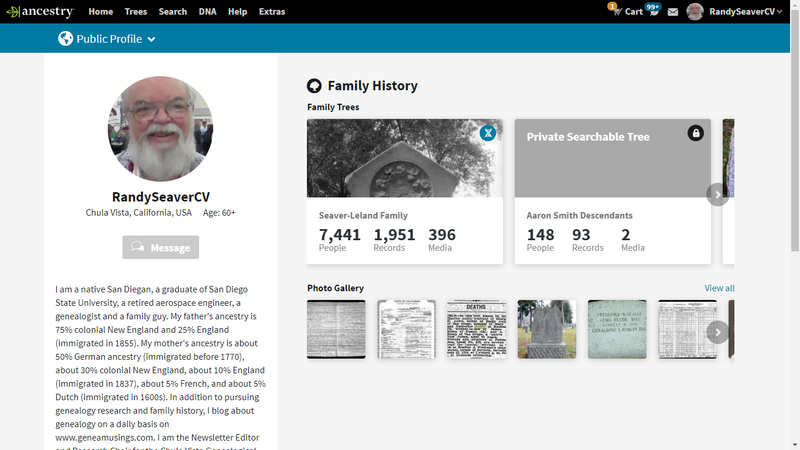 Here is my "Public Profile:"
The default "Public Profile" shows only your introduction information, your research interests, your searchable family trees, and your photo gallery. You can change your "Public Profile" by going to the "Settings" link on your "Personal Profile" and selecting on or off for a number of features. 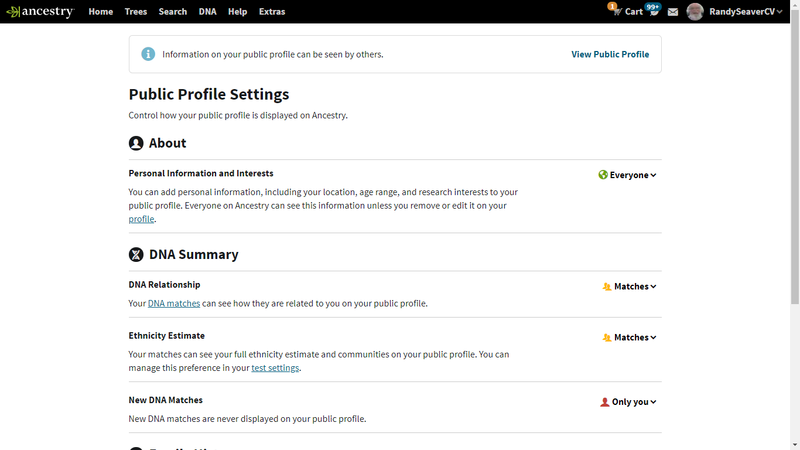 The default is that only my Matches can see my Ethnicity Estimate" and the "DNA Relationship" items. The only one I can change right now is the Ethnicity Estimate - I can change that to "Everyone" and it will show up in my "Public Profile." The benefit here is that this indicates I have done an AncestryDNA test. Note that "New DNA Matches" cannot be shown to anyone. 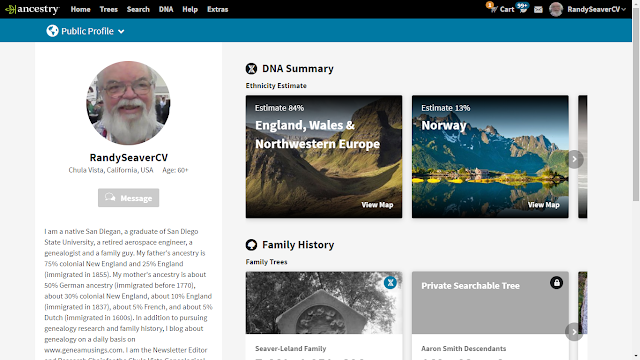 Here is my updated "Public Profile:"
This looks useful - but some of the content on the old page has been lost. This is a Beta feature still in work - there may be changes in the weeks ahead. This improved feature has not been released in Beta yet, and it will take several weeks after it is released in Beta to roll out to the guests and subscribers. New guests and subscribers will see it first, and then all subscribers will get it in the weeks after that. There will be real-time messaging, see if our messages have been read, and more. One feature that will not be included in the improved Messages feature is the "Folders" capability for messages. That is unfortunate I think. I don't get many messages, but some people do and the Folders feature was useful. I was curious as to why I had not received a new message on the Ancestry Message system since September 2018. I clicked on the "Site Preferences" link on the dropdown menu when I right-click on the user name, and noted that the button in "Community Preferences" was set to "Do not allow other members to contact me." I have no memory of changing that! Perhaps I did? I don't remember that option being available either. 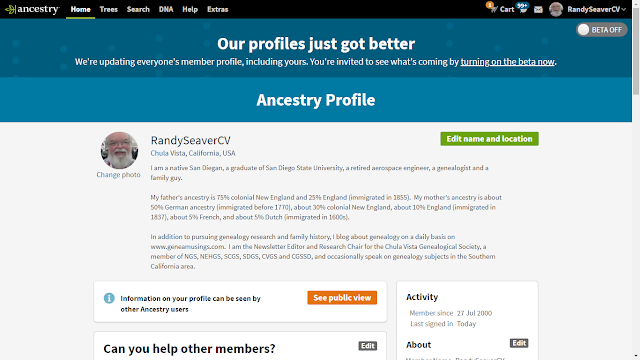 I changed it to "Anonymously through Ancestry's online Messages feature." It did not add any new messages to my list, so I either never got them or no one has messaged me since I changed it. 3) There will be white papers and probably blog posts to describe these two improved features - look for them! It's good they're adding a feature as to whether a message was read. I hope they update the mobile apps, too, because it's less obvious there if a user has messages. I'm seriously concerned about not having my folders. I have hundreds of messages and have kept them organized this way. I've had people contact me 10 years later and I review our conversation. Please don't delete my folders!!!! Yes, Please don't take away folders. That is where I store all the messages into family groups !!!! I agree about the folders. I use those all of the time, and have many, many messages grouped in my folders which helps me to keep up with who I'm corresponding with, as well as the surnames being discussed. Whatever made them think that that feature wasn't being used? They should be asking us about things like that. I sure do hope they won't delete the folders, I'd lose all of those messages. I have spent LOTS of time organizing my messages into folders. How does getting rid of folders help users??? I actually ran into this beta thing yesterday! I switched it and saw all the changes, but I didn't trust it (because I hadn't heard or read anything about it), so I chickened out and turned it off! LOL.